→What Is The Best Motorcycle Chain On The Market? 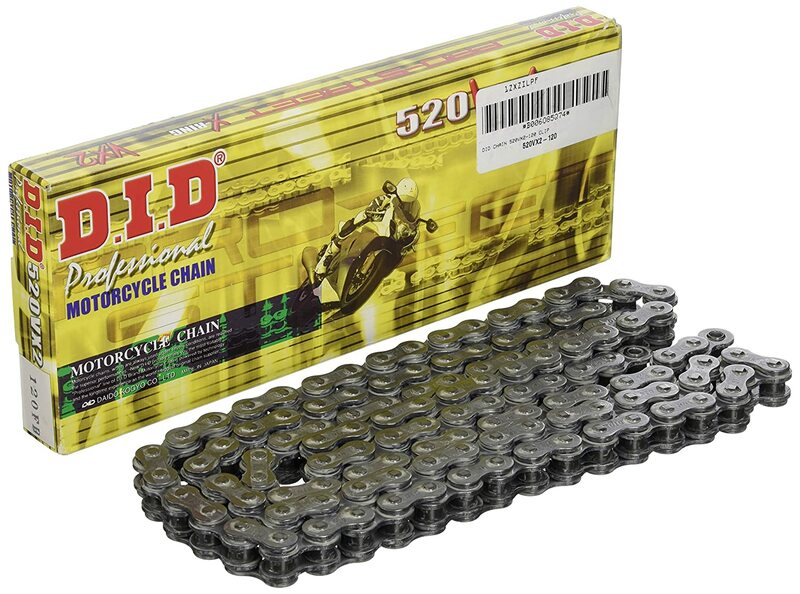 What Is The Best Motorcycle Chain On The Market? Pretty much all motorcycles are powered run by chain-drive. This means that all of the power coming from your engine runs through a small metal chain, so buying the best motorcycle chain you can and keeping it properly maintained is essential for problem-free riding. Chains are a fairly simple part of your bike’s mechanics: a sprocket which connects to the transmission drives the chain, and a sprocket connected to the rear wheel/tyre puts the power onto the road. But despite being simple the chain takes a real beating! You have to regularly lube the chain and take good care of it, if you neglect your chain or buy a weak one, it could damage your sprockets and possibly snap! **Below, you'll find my more detailed reviews about the motorcycle chains, but you can also click the links above to see current prices or read customer reviews on Amazon. RK proudly present themselves as being the number one supplier of chains to FIM World Championship teams/AMA World Superbike/Super-Sport Teams over the past 25 years - and there is a reason for it. Their well-drilled chains have been a favourite of bikers for what seems like forever! In particular this chain manages to combine a reasonable price with fantastic performance. It’s easy to fit (and even easier if you have the official RK chain breaker) and looks great in gold! The chain is suited for on or off-road use and will happily be subjected to all the hard-riding you can throw at it. D.I.D chains are fast being used and recommended all over the world. Their chains are known for being affordable, yet providing much the same performance and lifespan as more expensive brands. We think they are a serious contender within the chain world now and on-or-off-road provide excellent ‘bang for your buck’. 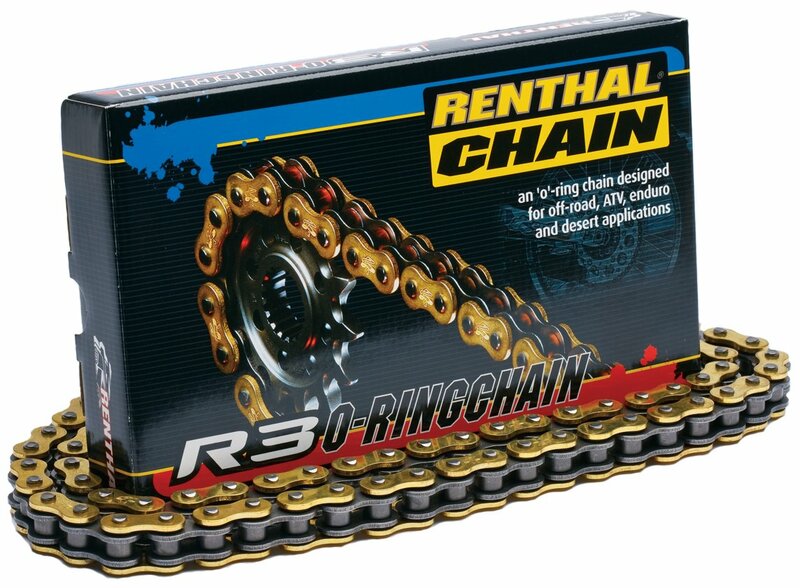 Renthal chains are almost synonymous with off-road biking, alongside R.K they are the biggest names out there and are well-regarded to provide a premium product and even here, on one of their basic models, there is everything you expect. A pair of rubber gloves in the box upon delivery is a nice touch! You’re going to need it with the heavily applied factory lubrication which clings to everything it touches!! I’m sure that this is a more expensive product, however, we think there is a lot of truth on both sides of the fence, it really comes down to you - but if you do plump for a Renthal chain you will never be disappointed. 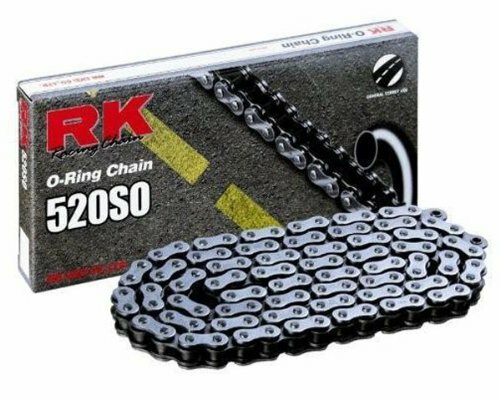 Although there are reports of this chain having reliability issues, we imagine that there are reasons for this such as the RK Racing chain being fitted to bikes with too much power. We always recommend checking the tensile strength of a chain against the recommendations for your bike specifically, because in cases such as this the chain may be the same size as one that fits your bike, but not actually be strong enough to take your horse-power! 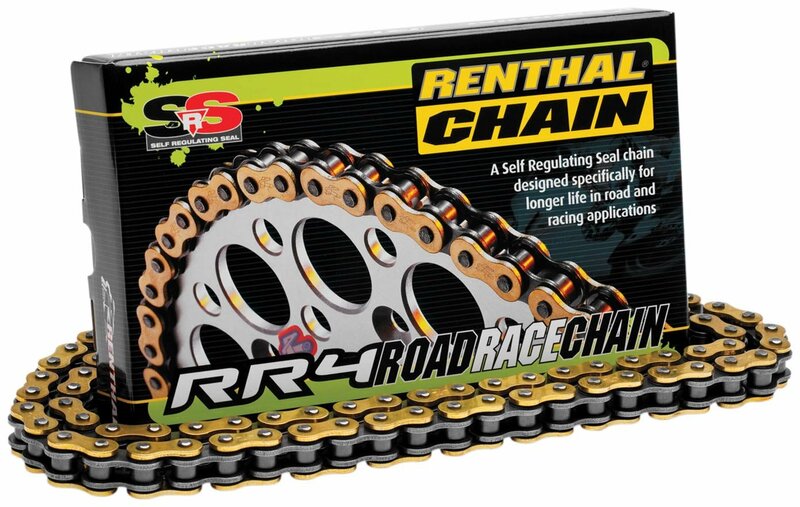 The Renthal SRS chains are widely considered to be the most technologically unique chains available. SRS stands for ‘self regulating seal’ and basically refers to the spring loaded seal used in the chain, which does not slip/lose traction over time. As the chain wears the seal expands and ensures consistent lubrication. It’s hard to know exactly how well this works, but we hear very good things about this chain. They are developed mostly for racing/sports bikes however, and many people might consider the higher price and advanced tech overkill for their daily commute! These older styles of chain have no ‘ring’ in between the inner sideplate and outer sideplate of the chain. They are usually lightweight and cheap to produce - it is very unlikely to find these chains on a modern bike, if you do it is likely to only be for off-road use or low-hp bikes. As you can see in the diagrams above and below, O-rings sit between the sideplates of the chain and create far less friction than metal on metal by pooling lubrication next to the inner plate. This prolongs the life of the chain quite significantly over a standard chain, and you can expect 12-18,000 miles out of a well maintained O-ring chain. X-ring chains are a newer variant of the O-ring chains, they use an ‘X’ shaped piece of rubber to slot in-between the sideplates and manufacturers suggest this holds lubrication better and can give up to 40% more life to your chain! The reason for this is that as opposed to the circular ‘O’ rings, these X-ring designs have multiple points of contact and multiple pools of lubrication on the sideplate. They are generally more expensive than O-ring chains, but have become quite common now. Basically chains are measured in eighths of an inch.The first digit is the pitch so 520, 525 and 530 are all 5/8 of an inch pitch from pin to pin. The remaining digits are the width, so 520 is 2/8 or ¼ inch wide. 530 is 3/8 of an inch wide. 525 is 5/16 of an inch wide. The chain on your bike will have these measurements written on the side of it, and failing that there are numerous ‘fit my bike’ applications where you can check the exact make/model of your bike and find out which chain fits. For this comparison we have chosen chains at a pitch of 520, with 120 links, this is a fairly standard fit for small to mid-engined bikes. Bikes with engines up to about 750cc can generally be run on these such chains, but make sure to look into your bikes specific requirements! The single biggest factor in how your motorcycle chain performs is always going to be how well you take care of it - buy good lubrication and use it regularly. Lubrication for your most important moving part is always a good idea! 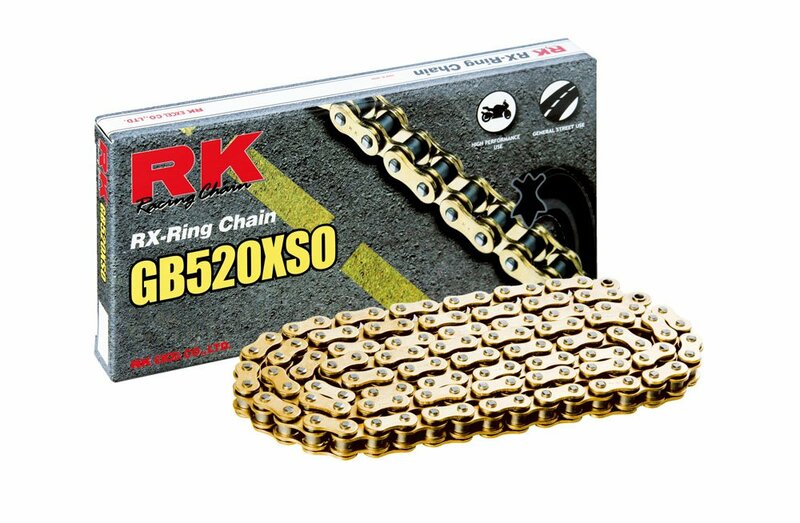 We think the chains here all offer great value in their own way, but our personal choice could be the RK Racing Chain GB520XSO-120, it’s advanced X-ring design coupled with a great price mean it’s a fantastic all-rounder, and will power your bike for miles and miles! If you liked the article just read, please leave a comment. Let us know what you think of this list of the best motorcycle chain reviews. Feel free to share this article to your friend or anyone who has the same question as you!